Motor yacht CRYSTAL BLUE is the ultimate head turner with sporty lines and exceptional sea handling. CRYSTAL BLUE is 80 feet (24m) of pure superyacht luxury. Built in Australia to the highest international standards, CRYSTAL BLUE is the perfect Gold Coast luxury yacht entertainer. 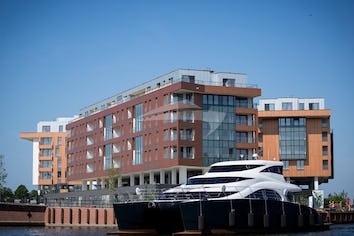 Enjoy alfresco dining and beautiful views on board, or kick back and relax in her open space on the bow with sunbeds. 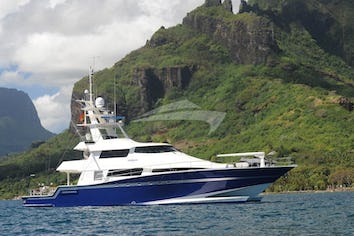 CRYSTAL BLUE is one of the most versatile charter yachts on the Gold Coast. Enjoy a sit down dinner in her comfortable salon, or make room for the perfect dance floor. CRYSTAL BLUE sleeps up to eight guests in 5 star luxury amenities with the privacy of a separate toilet and shower in each of the four deluxe bedrooms, including a master suite, a double cabin and two twin cabins. She is also capable of carrying up to two crew to ensure a relaxed luxury yacht experience. Ideal for cruising into the heart of Surfers Paradise, CRYSTAL BLUE can take you through the expansive waterways of South East Queensland— all the way to Brisbane or Tangalooma, weaving your way through the truly unique waterways of the Broad Water to Moreton Bay. 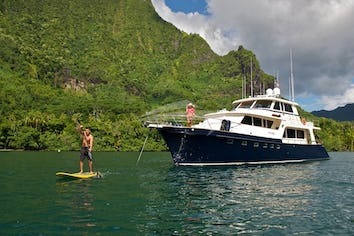 CRYSTAL BLUE is also available for day charter and events, and it is able to carry up to 60 people on board.